Taste test: These were really good ketchup chips. The chips were light colored with a medium amount of visible red powder on them. 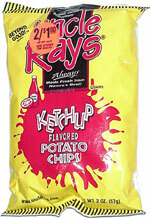 They had a mild (rather than tangy) but still very tasty ketchup flavor, on a really good, thin, crisp chip. The mix of ketchup and potato flavor was quite delicious. Smell test: Nice ketchup smell, very tomatoey and slightly vinegary. 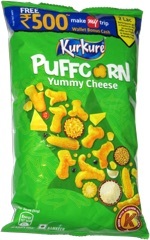 This snack was discovered by Jeremy at C'est Bon Convenience Store in Harvard Square, Cambridge, Massachusetts. Review published .